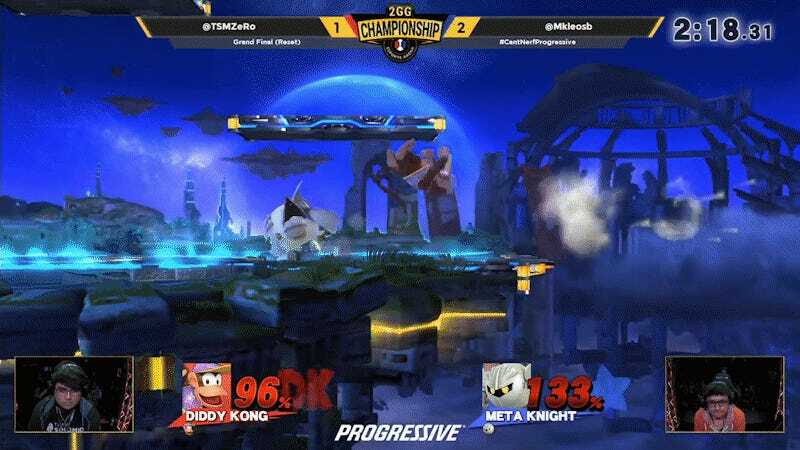 The fight between Leonardo “MkLeo” Lopez Perez and Gonzalo “ZeRo” Barrios in the 2GG Championship final was some of the highest-level Smash 4 I’ve ever seen, with incredibly clean play and perceptive reads and adaptions. This weekend’s 2GG Championship was created to be a capstone tournament for the Super Smash Bros. For Wii U scene. It was a fitting end to have two of its biggest titans clash in the grand finals. Perez and Barrios have faced off so many times, and it was rewarding as a fan to watch them battle in a high-stakes championship final. I strongly recommend that any Smash 4 fans watch the replay on 2GG’s Twitch channel. The tone was set early as Perez came out swinging on his Meta Knight pick. A multi-character specialist, Perez brought Meta Knight to the ring for the championship, and it paid dividends in situations where his rage was high enough to do some real damage to Barrios’s Diddy. Barrios adapted over time, using his banana peel and some excellent ledge play to force some tricky situations on Perez. My favorite moment of the series, though, was in game four of the second set, where Barrios turned a tricky off-stage situation into a stock kill.